Drawing from a range of faith traditions and academic disciplines, a new Muslim-led publication aims to foster thoughtful dialogue. On May 14, 2017, a group of scholars, students, and interested onlookers gathered at a former Christian church sanctuary — now the heart of a Muslim college — in Berkeley, California, to celebrate the launch of Renovatio, a journal attempting to foster dialogue and connections between disparate groups ranging from scholars to religious leaders to lay people. The journal’s editor-in-chief, Hamza Yusuf, is an American convert to Islam who has become one of the leading Muslim public intellectuals in the West. 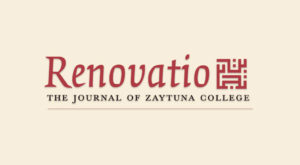 In 2008, Yusuf and several colleagues founded Zaytuna College in Berkeley, which in 2015 became the first U.S. Muslim college to receive formal accreditation. This idea of making something new again — as opposed simply creating an entirely new structure — is one of the animating forces of the journal. But another of its core principles might be termed bridge-building, both between different religious traditions and between different kinds of people. “This project started primarily because we felt there were a lot of scholars — Muslim scholars but also scholars of other faiths — whose work is never seen or read by the public, by anybody outside of their specialized fields,” says Safir Ahmed, who serves as Renovatio’s editor. “The idea is that our writers will draw from the faith traditions, from theology, philosophy, from history, from social sciences to look at contemporary challenges through the lens of those traditions,” Ahmed says. Essays in the journal’s first issue put that theory into practice, covering topics ranging from the difference between justice and mercy to whether exposure to the torrent of imagery on our smartphones constitutes a moral hazard by crowding out space for thought and reflection. Another essay discusses Muslim metaphysicians’ conception that all things in existence are also “modes of consciousness, bliss, awareness, and knowledge,” leading to the surprising conclusion that the universe and all its contents can be seen as alive. A recurring “Text Messages” feature offers short reflections on important texts, ranging from a poem by the the Sufi mystic Rumi to Hamlet’s Soliloquy.